Another important feature of this pillow is the bamboo cover. Though it may sound strange, the material is softer than cotton and adds both extra airflow and breathability. That then keeps the pillow cool and makes it so that your face and head are not sweaty when you wake up. If you want something that feels good and ensures you don't get too hot in the night, this is a great choice. If you want a brand that is truly as cool as the other side of the pillow, the Classic Brands Reversible Cool is the choice for you. This product uses open-cell memory foam, which is distinctly different from other more popular foams on the market. It is much more open than other substances, which allows air to more easily flow through it. That extra air then moves throughout the body and dissipates body heat to create a cool environment. The other part of this model is the Cool Gel technology, a feature that generates a cool sleeping surface for all sleeping patterns. That upgrade works with the breathable knit cover to make sure you never get hot as you sleep. It also comes with a special 5-inch loft support to help both back and side sleepers wake up feeling refreshed and ready for the day. Of course, the biggest trait of the Reversible Cool is that it can be reversed. This means you can use it all throughout the year. On warm nights, you can sleep on the gel-sided layer; and on colder nights, you can use the memory foam side. Some cooling pillows are only good for part of the year, but that is not the case with this one. The third entry in our discussion of the best cooling pillows is the Perfect Cloud Dual Option. This model works on two levels: comfort and coolness. 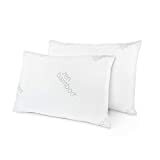 Being able to stave off sweat or excess heat is the primary reason to choose a cooling pillow, but that does not mean you have to sacrifice great support. This model works on both fronts to generate one of the most complete packages you can find. As with the reversible model above, the Dual Option Cooling pillow has two distinct sides that help you adapt or shift your sleep to your specific needs. One side has the gel cooling layer, and the other the warmer, but still comfortable, memory foam. You can choose whatever side best fits your body temperature, and each offers different types of support as well. This pillow comes with a ton of upgrades that you won't find in other brands. The two sides have ventilation holes, as well as a gusseted design to facilitate as much air flow as possible. In addition, this model is both hypoallergenic and dust mite resistant. If you want a pillow that keeps your head cool and comes with extra neck support, this is the best way to go. Nest Bedding is a company best known for their patented Easy Breather pillow. To make the ActiveX, they took the great technology used in that popular model and ported it over to a soft, unique design. The biggest difference between the Easy Breather and the ActiveX is the phase change cover, which gives the X a nice aesthetic look, along with a sleek, ergonomic design. The cover is important because it works to absorb a lot of heat and regulates temperature throughout all phases of the night. You want your pillow working to keep you cool as much as possible, and the Nest Bedding ActiveX does that extremely well. It also has a special soft feel in addition to an adjustable loft to ensure the best rest possible, regardless if you sleep on your stomach or your side. This model is one of the softest and most comfortable pillows on the market. It offers an incredible amount of cooling features, but without sacrificing any support. Some pillows can resist sweat, but they don't all promote alignment like this model. Coop Home Goods creates quite a few pillows, but one of their best is the fully adjustable Eden. This model is a creatively designed product that comes with a range of top-of-the-line features. 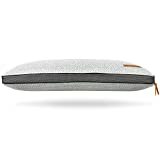 Every pillow on this list offers something different, and the Eden hits the entire spread by offering breathability, a bamboo cover, an adjustable interior, as well as an advanced cooling system. One of the best features about the Eden is that you can take out stuffing to make sure your head rests exactly where you want it to. It is easy to get caught with pillows that don't feel right, but the Eden's adjustability ensures you won't wake up in an odd or uncomfortable position. If it ever does get flat, all you need to do is toss it in the dryer for ten minutes to make it fluffy again. Coop Home Goods offers high-quality at affordable prices, and the Eden is no exception. However, that lower price tag does not mean you're missing out on any premium features. The bamboo cover helps regulate heat, and the shredded memory foam brings extra support to your head and neck areas. The pillow is also extremely soft and hypoallergenic. Every cooling pillow works to keep heat away as you sleep, but they all do it in different ways. The Laniloha Orthopedic Bamboo pillow is exceptional for anyone who experiences neck pain or neck sweat. That is because the model is built from tough memory foam that gives it a solid great core. That extra support forms to your head to relieve any excess pressure that might stress your neck, head, back or shoulders while you sleep. The way this pillow regulates heat is with the Cool Gel Technology, which once again ensures you will always be refreshed during the night. It is also crafted with eco-friendly bamboo that is not only softer than the more commonly used cotton, but it is 4-degress cooler as well. In that way, you get an advanced orthopedic design on top of an excellent cooling system. The Lanihola Orthopedic Bamboo is one of the best models for anyone who needs extra neck support, or for those who have problems with excess neck sweat. However, it also works wonders for anyone who suffers from issues like snoring, migraines, and insomnia. Another one of the best cooling pillows on the market, the Cooling Gel by Product Shop has a contoured design and memory foam interior that work together to ensure the model always keeps its shape. That feature then perfectly complements the cooling gel technology that actively disperses heat away from the head. That redistribution is a key part of this pillow because it ensures you will sleep as comfortably as possible. Though this model can be used by anyone looking to keep cool on warm or stuffy nights, it is best for side sleepers. The packed foam and special contour design give extra cushion to the head and neck area in order to provide extra support all night long. While it is a bit smaller than other models, there is no doubt that the Cooling Gel is a great option for anyone looking to make sure they stay dry even during the hottest parts of the year. One of the most stylish and good-looking pillows on this list, the Urban Bloom Domus Pillow is a sleek, yet-comfortable model with an incredibly elegant design. This cooling pillow seeks to go beyond other brands by creating an enticing package that is hard to turn down. The Urban Bloom Domus has all of the features you would expect in any high-quality cooling pillow. It is machine-washable, durable, soft, and offers great support. A big pull of this product is its 5-inch-thick contour foam core that offers minimal flattening and enhanced support. That not only promotes a great night's sleep, but it also makes it incredibly durable. If you're looking for a pillow you will be able to use for years to come, this is the best choice. Of course, to be on this list, the pillow also has to keep you cool. The Domus does that with air-releasing mesh and special air channels. Both features generate some of the best heat dispersion on the market and help you keep off heat no matter how hot the seasons get. 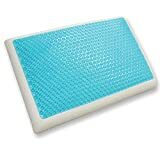 The TruContour Firm Cooling Gel Memory Foam Pillow is one of the best cooling pillows on the market because of how far it goes to combine comfort and support. 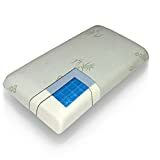 This product uses cooling gel memory foam to keep your head cold in the summer, but also comes with a warmer side to keep you cozy during long cold winter nights. This pillow is one of the most versatile you can buy, and offers a range of different options for every type of sleep. 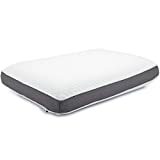 It has a three-fabric design that comes equipped with micro mesh to add extra cold transfer, and the medical-grade memory foam is available in both soft or firm forms. TruContour also outfitted this with special honeycomb mesh fabric for extra comfort and breathability. Washable, snug, and comfortable, this truly is a complete package. We finish with, as suggested by the name, one of the most relaxing cooling pillows around. The Zen Bamboo Ultra Plush Gel Pillow is all about comfort. Not only does it come with high-quality and eco-friendly materials, but it is hypoallergenic, supple, and incredibly soft. This cost-friendly option comes with a 30-day guarantee, stain resistant materials, and a clean, comfortable feel. This model is extremely plush, but has enough cooling technology to prevent you from ever getting stuffy or sweaty while you sleep. The secret to the Zen Bamboo Ultra Plush is the premium fiber gel that helps bring extra comfort to each and every sleeping position. The cover is made with bamboo to give a breathable surface, which further helps keep any unwanted heat away from your head, neck, and face. The above 10 options are the best cooling pillows on the market. No matter how comfortable your bed is, you will never get great sleep if you spend the whole night sweating. The brands in this article, though different, will all give you heat relief in one way or another. As long as you do your research and take your time, you will find the best cooling pillow for you.